The evening shows staged by the Rencontres d'Arles Voies off Festival have become a worldwide reference for the discovery of new artists and the follow-up of photographic creation. Through its themes, the festival takes a critical look at the evolution of the present world. 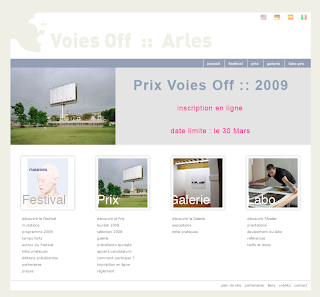 Each year, around twenty different nationalities are represented at the Festival Voies Off. Each year The Voies off Prize, granted by a jury of saluted professionals, is awarded for an artist's high-quality work and insightful vision. A 2000 Euro grant will be awarded to the prizewinner. La commission de sélection choisit les dossiers qui présentent un travail personnel et original, sous la forme d'une série déterminée par une unité de pensée, de vision ou de thème. Le critère principal de sélection demeure l’expression d’une vision d’auteur. Un jury composé de professionnels et de membres de Voies Off désigne pendant le festival, parmi les dossiers retenus pour la programmation, le lauréat du Prix Voies Off. Festival Voies Off. Photographie et arts visuels. - It is a resource on notable and emerging photographers and their work. 8 October 2011 - I'm updating the blog again. Would appreciate your feedback, input and advice. (only) 3 adds SUPPORT THIS BLOG. The aim of this blog is to flag events that generate media coverage/publicity for photographers (photo exhibitions, books etc.) and that promote photography and the works/ views of photographers or awareness for concerns. You will not find information on national awards and grants. For such info please check your leading national photography magazines and websites. Thank you for your input, views, submissions and feedback. They are appreciated and essential to optimize and maintain the blog! Do you find this blog useful? Want to support it? Who won what? Use the search box (at the bottom), type a name and see the results. I set this blog up in 2007. I became curious about photo awards/honours, after winning a small prize myself, but could not find a substantial online resource. It was then that I decided to compile, curate and share information. This blog is meant to inform; to show award winning/inspiring photo works and to share opportunities that generate publicity. This blog could also be used as a resource on emerging and notable photographers. I hold a degree in photography but work as a webdesigner (WordPress-Thesis) and ICT-er.